[PDF] Advanced Windows Memory Dump Analysis with Data Structures: Training Course Transcript and WinDbg Practice Exercises with Notes, Second Edition | Free eBooks Download - EBOOKEE! Description: The full transcript of Memory Dump Analysis Services Training with 10 step-by-step exercises, notes, and selected questions and answers. Learn how to navigate through memory dump space and Windows data structures to troubleshoot and debug complex software incidents. The training uses a unique and innovative pattern-driven analysis approach to speed up the learning curve. It consists of practical step-by-step exercises using WinDbg to diagnose structural and behavioural patterns in 64-bit kernel and complete (physical) memory dumps. Additional topics include memory search, kernel linked list navigation, practical WinDbg scripting, registry, system variables and objects, device drivers and I/O. Prerequisites are basic and intermediate level Windows memory dump analysis: ability to list processors, processes, threads, modules, apply symbols, walk through stack traces and raw stack data, diagnose patterns such as heap corruption, CPU spike, memory and handle leaks, access violation, stack overflow, critical section and resource wait chains and deadlocks. 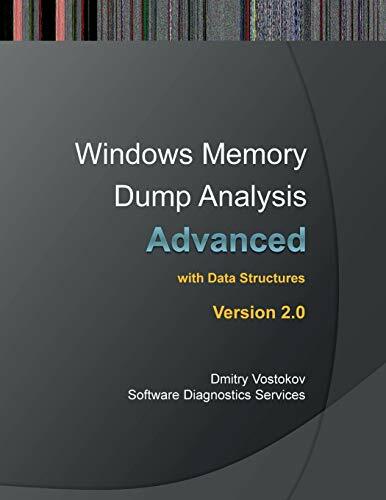 If you don't feel comfortable with prerequisites then Accelerated Windows Memory Dump Analysis training book is recommended before purchasing and reading this book course. Audience: Software developers, software technical support and escalation engineers, reverse and security research engineers. The 2nd edition contains updated exercises for the latest WinDbg version from Windows SDK 8.1. No comments for "[PDF] Advanced Windows Memory Dump Analysis with Data Structures: Training Course Transcript and WinDbg Practice Exercises with Notes, Second Edition".